WordPress makes it easy to add images to your content. Images can be used in your pages or your posts directly. You also can use the insert picture icon to insert a picture that you want to link to, without uploading to your server. Use captions, descriptions and the gallery for display all images attached to your posts or page. Go to Posts -> Add New or Pages -> Add New, or open an existing post in editing mode. As of WordPress 3.3, you can drag and drop your files into the box that appears, or click Select Files to choose a picture from your computer to upload. Note that the drag and drop uploader only works in browsers with HTML5 upload support such as the latest versions of Chrome, Firefox, or Safari. Other browsers will still show the Select Files button or the basic browser uploader form. Once the uploading/crunching process has completed, you will be given the option to edit some settings before inserting the image into the post/page. Description – Text displayed with the image in your dashboard and attachment pages on your blog. Link URL / Link Image to: – The URL/web address to which the image will be linked. Click the File URL button to link the image to its original, full-size version. Click the Post URL button to have the image linked to its attachment page. Alignment – The position of the image within your post or page. See our page about image alignment for more help. Size – The size of the image. Click the Edit Image button beneath the image preview to rotate, flip, scale, or crop the image. Click Insert into Post when you’re done adjusting the image’s settings. There are some aspects you may want to know about using images in posts and pages. 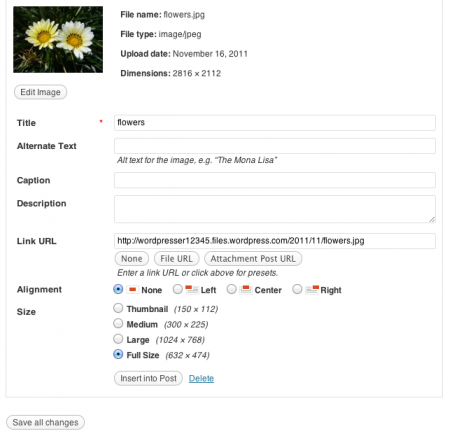 Did you know that WordPress re-creates your image files in different sizes for use? And you can set all sizes? Also, there are some issues on aligning images in posts and pages and hot tips for improve image formatting, such captions and more. WordPress has an in-built image gallery feature incredibly simple to use. So let’s say you are writing a post that you want to include an image gallery in. The Media Library SubPanel allows you to edit, view, and delete Media previously uploaded to your blog. Multiple Media objects can be selected for deletion. Search and filtering ability is also provided to allow you to find the desired Media. If you do need to upload Media, even if that Media is not related to a Post or Page, then you need to use the Media Add New SubPanel.